Who does not like Jollibee? My kid and nephew sure love this big guy. I think for one, they like the chicken and spaghetti and the toys! 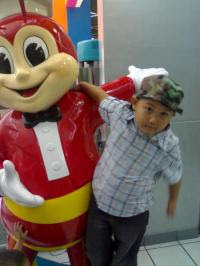 Got this old picture of my kid hanging on with Jollibee.